There are many different methods that one can employ to protect PDF documents and the choice of which to use really depends on your target audience how effective you want that protection to be. Some of the methods explained here vary from easily exploited deterrents to full blown WW2 encryption and access control. What kind of copy protection software do you need? Prevent changes to PDF document. Prevent printing of PDF document. Set expire date on PDF document. Control access to PDF document. Limit number of prints of PDF document. Limit number of views of PDF document. Prevent copy of PDF document. 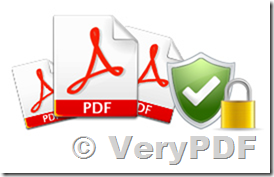 Prevent unauthorized sharing of PDF document. Protect your documents by uploading and encoding their KEY on VeryPDF's secure cloud server. Share your files with who you want - set permissions such as printing and expiry. Track your shared documents and manage your address book through your Log URL. Most document security solutions only protect your data up to when the recipient receives it. Others only allow recipients to view files online. VeryPDF's proprietary security platform continues to protect PDF documents AFTER they have been downloaded by the intended recipient; preventing unauthorized sharing / forwarding, accidental leaks, and illegal copies. VeryPDF provides a wide range of options for sending your files to your intended recipients. You are in control over whether a file can be downloaded or not, how it is viewed, and what your recipient can do with the file. An Address Book that can be integrated with Gmail makes managing recipients easy. Keep track of who has your documents, who has opened them, and when. Update permissions in real time. If a mobile device containing your document is stolen or lost, you can revoke access to your files at any time. This entry was posted in PDF Security and tagged drm pdf, pdf security. Bookmark the permalink.